Perched above the sparkling waters of the River Isla in beautiful Glenisla this lodge makes a very comfortable base from which to explore the lovely surrounding area. Enjoying a peaceful setting with no near neighbours it lies 2 miles from an adventure centre offering outdoor pursuits and cycle hire. Excellent hill walking cycling and riding can be enjoyed locally as well as loch fishing (by arrangement) whilst Alyth (11 miles) has shops and three golf courses. Pub serving food 700 yards. 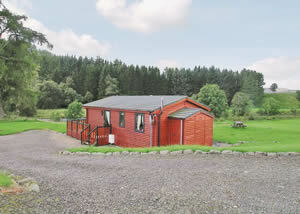 Larch Cottage is in or near Glenisla in Perthshire, Central Scotland.